Dragon Ball Super Episode 125 Review: With Imposing Presence! God of Destruction Toppo Descends! – Goku and Vegeta are still going at it with Jiren. Whereas 17 has witnessed Toppo’s mighty transformation and Frieza? He’s been a witness as well. A direct Witness of Toppo's Power. How will Universe 7 vs 11 go today? 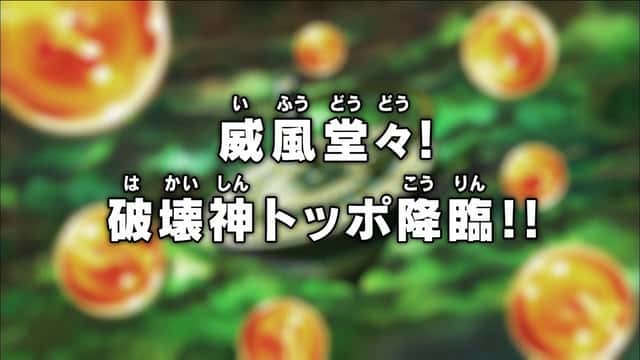 Dragon Ball Super Episode 125 Spoilers Below!!! The animation was surprisingly amazing in this episode. There were not a lot of scenes or frames where I could see bad art. But the second half of the episode was superior in every way. Animation wise this was definitely top notch. Another minute passed by in this episode. Although there weren't any eliminations in this episodes but still it helped in the overall story. Toppo finally got to showcase what his true power is. And we also got the idea on how far behind Frieza and Android 17 are currently from Goku and Vegeta. Also seeing as how Jiren is even stronger than Current Toppo. This is just maddening. 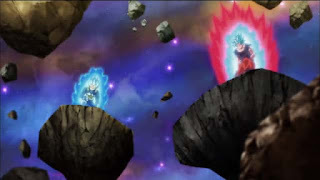 The episode starts with Goku and Vegeta are still fighting Jiren yet can't seem to any damage. Gohan is still confident that Goku and Vegeta can win. Beerus calls Gohan by his name instead of saying "Goku's Kid", and acknowledges his effort. We see Goku and Vegeta Going full power again and challenging Jiren again. 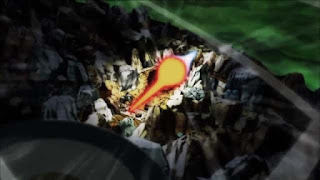 Goku uses full nelson on Jiren, Vegeta then launches a Final Flash which Jiren deflects with just his eyes. We then cut to 17 and Toppo fighting. 17 is able to keep Toppo's attack at bay with his barrier. 17 then attacks Toppo with a barrage of Ki Blasts. Toppo says that these attacks won't do anything to him. But 17 says that it's according to plan. Android 18 understands what Android 17 is doing. 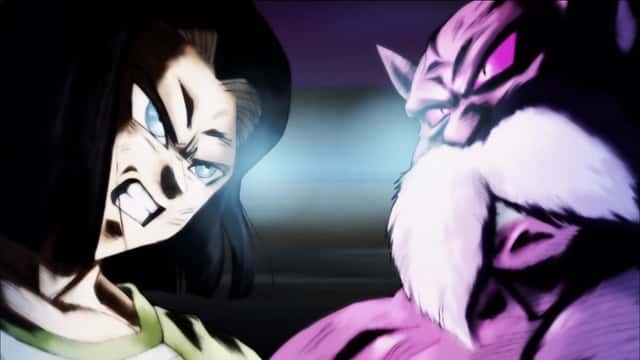 Apparently Android 17 is using his Infinite energy to keep Toppo at bay long enough for the time to end. Seeing as only 6 minutes are left. Toppo however sees through 17's energy barrage and attacks him. Toppo powers up and launches an attack with all his Justice. 17 launches a Blast as well. But gets pushed to the edge. 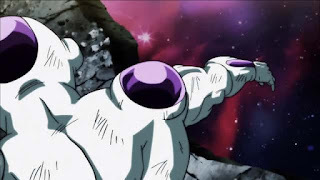 Before he could be thrown however Frieza jumps in the fight and starts shooting energy blasts on Toppo. Toppo however still continues his attack. Frieza also continues to attack Toppo and begins mocking him as well. This causes the 17's attacks to overwhelm Toppo. Everyone in Team Universe 7 thinks that 17 eliminated Toppo but Whis notices that Toppo is in the sitting area and is still on the stage. Frieza calls him Trash and offers to gently eliminate him. But Toppo silently stands up. His Uniform shirt is now ripped up and his anger meter is over 9000. Toppo states that "Justice is Worthless Now". He then starts emitting immense energy which EVERYONE notices. 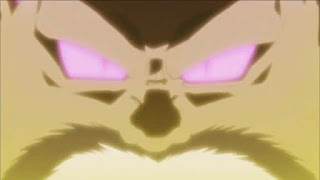 Shin calls says that this power is similar to the Gods. Jiren and Belmod says that Toppo has decided to use "That Power". Toppo's body start to change. His body becomes darker. His eyes turn purple. His body even out and looks muscular. His stance changes and he gets the same marking on his body that Belmod and Marcaritta have on themselves. 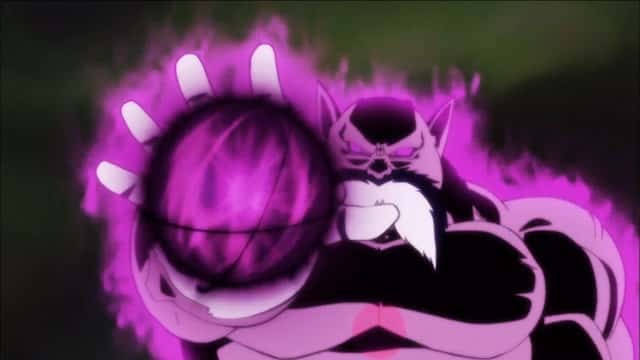 Frieza is unimpressed and launches death beams on Toppo which just disappear as soon as they touch Toppo because he is now covered in "Hakai" energy. Beerus recognizes that Toppo has God of Destruction energy. 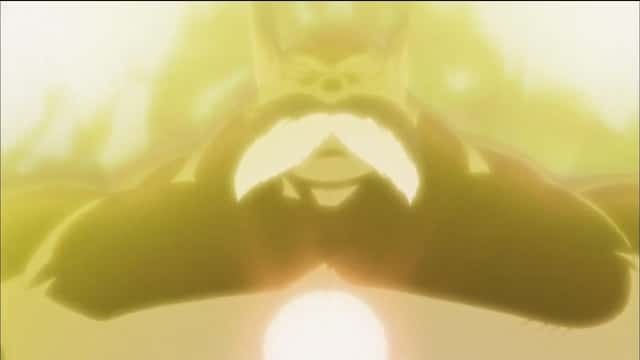 Belmod confirms this and also says that Toppo is a candidate to be one of the Gods. 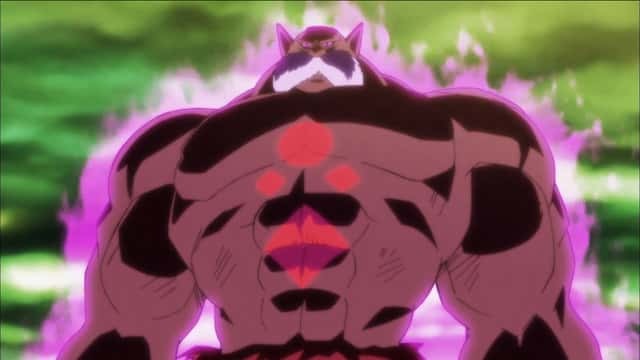 Marcaritta says that its time to show the result of his training with Belmod celebrating the birth of a New God of Destruction, Toppo. Frieza laughs and claims that God of Destruction power is no match for "Golden Frieza". Toppo launches a Hakai and Frieza is confident that he can stop it with just one hand as he was previously able to stop a hakai from Sidra. But Toppo has launched a full powered version and Frieza is unable to cope with it and gets seriously hurt. This causes the entire stage to break in half and the World of Void to change with purplish color and what look like stars. 17 and Toppo then begin to fight with 17 noticing that Toppo's normal attacks are far more powerful then before and 17's attacks are just getting erased because of Toppo's Hakai aura. Beerus confirms that Toppo is indeed using Hakai but 17 is sure that there is a weakness. After some Hakai blasts from Toppo, Beerus notices that Toppo needs to charge his attack before launching. Frieza arrives angered and decides to use his Super nova attack to destroy everything. Toppo only uses a fraction of his energy to destroy it. Then punches Frieza in a brutal fashion. He then tries squishing his head and then says that "Trash belongs in the bin" same as Frieza said to Toppo earlier on. And proceeds to kick him out, but 17 manages save him and he falls near the the edge and survives. 17 decides that he would fight the new God of Destruction Toppo as only 5 minutes left before the end of the Tournament of Power. Toppo looked Great after such a long time. Frieza gets what he deserved. A good beating. Some inconsistent dialogue from Frieza. Like really, energy to destroy a planet is his big deal. that is so early Namek saga. 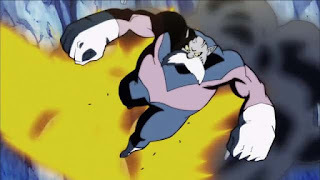 Toppo wasn't truly established as a candidate for the God of Destruction title in the anime. We only knew about this because of Toei's website and then later on in the Manga. Dragon Ball Super Episode 125 was an action packed episode. Everyone was only caring only about Jiren, But now Toppo is also a major threat. Universe 7 chances of wining has gone down amazingly considering that Jiren alone was pretty much a huge obstacle and now Toppo is definitely a major player. And showcased how much a difference is between Frieza, 17 and Toppo. Definitely a great episode and I am looking forward to the next episode.